Home Facebok Fanpages Facebook Tips Amitabh Bachchan has become active on Facebook. Amitabh Bachchan has become active on Facebook. Social Media tools like Twitter and Facebook allow celebrity fans to follow their stars from their cozy home spaces. All you need to have is either a computer or a Smart Phone. Till many years Amitabh Bachchan the greatest Indian Bollywood Actor was only active on Twitter however now Big B has finally decided to be also more active on Facebook. The day he announced this his Facebook Fan following reached a massive 0.8 Million. Today the Fan following stands at 1.4 Million. Even though Amitabh Bachchan already had this official Facebook fanpage http://www.facebook.com/AmitabhBachchan since a long time he was not that active on Facebook. 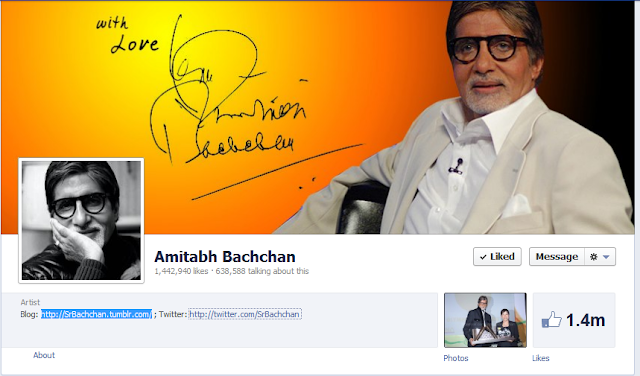 Looks like Big B has realized that Facebook presence is also important and also very much more interactive than twitter. Big B announced this on twitter that he would love to be also very active on Facebook and has also uploaded few videos. Its for sure that people would love to see Facebook updates from Big B as Twitter updates sort of get lost if you are following many celebrities. Some of the other official Social Media activities Amitabh Bachchan is part of are. I am sure you guys would love to follow Big B wherever he goes.